The tips below are for making the healthiest smoothies ever, and having more fun in the process! Change up the ingredients. Using different fruits and vegetables will help you get an even amount of nutrients and health benefits from the varying components. I try my best to use what’s locally in season. If you’re into green smoothies, be sure to rotate the greens every couple of weeks. This will also keep your smoothies new and exciting and prevent smoothie boredom. Fresh is always best. 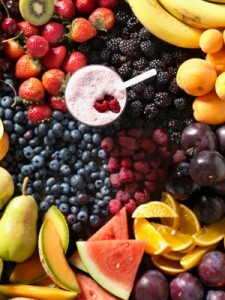 The fresher the juice and ingredients you use in your smoothie, the better the flavor and nutrition. Use organic ingredients in your smoothie whenever possible, not only to increase nutrition and avoid pesticides, but also for better taste. Healthy Tea Time. Use a healthy tea instead of water, milk, or juice as the base of your smoothie to boost the nutrition. I often make a large pot of medicinal tea on the weekend and store in half gallon mason jars for use during the week. If you’re working on a particular health issue there’s almost certainly an herb, if not several, that can help address that issue and would be a great tea candidate. Even something as simple as green tea is great place to start. Smoothie Sweetness. Using dates is a great way to sweeten your smoothie. Remove the pits and soak them overnight or for at least an hour before blending. If using a sweetener, stick to the good ones. Honey, maple syrup, and stevia are excellent choices. 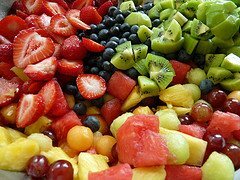 In the winter you might find your fruits are not as sweet as you’d like, causing your smoothies to not taste the best ever. Try using fruit juice as the base of your smoothie instead of water. Juice it up. Juice your own fruits and vegetables for use as the base of your smoothie. Nothing is fresher, tastier, or healthier. Add in some Kefir magic. Milk and young (Thai) coconut water kefir deliver a probiotic punch while improving digestion and nutrient assimilation. Spice it up. Various spices enhance both flavor and nutrition. Play with them and perfect the taste. Cinnamon, cayenne pepper, ginger, and nutmeg, are a few good options. Protein Power. A good protein can go along way, especially for guys looking to put on muscle. Make sure you’ve got a good source, Sun Warrior is my preferred protein. For more information, see my Sun Warrior protein review. Healthy Fats. A good fat like coconut, flax, or hemp oil, an avocado, or cream will keep you satiated and full of energy for hours, and put the smooth in smoothie. Get Salty. Adding a high quality salt to your smoothie not only provides much needed minerals, but also enhances the taste. Celtic Sea salt, Himalayan Pink salt, and Redmond salt are excellent options. For more information on why salt belongs in all of your smoothies, click here. Superfoods Galore. Experiment and try different superfoods to really boost the nutrition of your smoothie. Maca, cacao, goji berries, bee pollen, aloe vera, coconut oil, hemp seeds/protein, spirulina, and acai are great to start with. Seed it. Flax, hemp, and chia seeds are perfect for boosting the nutrition of your smoothies. Try soaking your chia seeds in a little water to make a gel that gives your smoothie a nice smooth consistency. Herbalicious. Adding Chinese herb powders like Ginseng, Astragalus and Rhodiola is a great way to increase the medicinal properties of your smoothie. Turn up the Base. Don’t skimp on the base of your smoothie. Use high quality water (filtered or spring water), almond, coconut, or raw milk, or fresh juice. One of my favorite bases is water from a young (Thai) coconut, which provides sweetness and a bevy of electrolytes. Go Green. Green Superfood powders like Boku, Vitamineral Green, and Sun Warrior Ormus Supergreens increase the nutrition of your smoothie in a hurry. I like using these in the winter when fresh greens are harder to come by. Mushroom Power. Boost your immune system with mushroom powders like Reishi, Cordyceps, and Maitake. Just open a capsule or two and dump in your smoothie. Like using ice cubes in your smoothies? Try coconut water ice cubes for flavor and additional nutrients including magnesium, potassium, and other electrolytes. Make some some Banana Cubes. Bananas are a staple smoothie ingredient, and if you like using frozen bananas in your smoothie like I do, try this. Peel and break your ripe bananas into smaller chunks, and place those chunks into a big zip lock baggie or container before freezing. I usually do this for 5 to 6 bananas at a time, or a good weeks worth of smoothie making. Kid-Friendly Green Smoothies. Kids are picky eaters. I sure was. Often times it’s the color and texture of a smoothie that deters children. Find something simple that they’ll drink, then slowly over time work in the spinach and other greens. There you have it, my top 20 tips for making the healthiest smoothies ever. I hope you learned a thing or two that you can apply to your smoothie making right away. Not sure about the benefits of healthy smoothies, see 21 Reasons to Consume Healthy Smoothies. Have an improvement or alternative to a tip above, or a good tip that wasn’t included? Please share below in the comments. Cheers! really good tips for healthier smoothie! 1 avocado 1tbs. chia seeds ground 3 lge. strawberries 1 tbs. steel cut oats 1 banana and 1 cup of H20 it was sweet and real good did i do my body good? I am an avid runner and was wondering if you could recommend a good recovery smoothie. I only have one condition: most of the ingredients have to be stuff I’d probably have in the fridge or can run to the grocery store to get. As much as I love superfoods, the nearest place that sells them is a good 15 minute drive away. And after a hard run, I just want something I can blend up and gulp down. Any ideas? If you don’t have coconut oil (get some ;)) then use a little avocado, or use 1/2 avocado in place of the banana to get your healthy fats. Increase amounts for a larger serving. Thank you so much! I do need to get some coconut oil, but it’s not a big deal. I will let you know when I try it! Awesome smothie ideas! I love making my own blends and trying new things. I’m wondering if you have any ideas for fruit smoothies after a 3 day fast? I mean a complete fasting, no food or liquids. So I need something that won’t injure my digestive system like acids etc. I would like to reboot my system and start out fresh to give my body all the nutrients it needs and make sure they’re not blocked by any garbage. From there add on whatever feels right to you. Coconut oil, cacao, chia seeds come to mind. I’m working on an article for diabetes and smoothies. Stay tuned. Should be published in about 3 weeks. In the meantime, limit the amount of sugar in your smoothies. Consuming a healthy diet including healthy smoothies should help with kidney stones. You could try Chanca Piedra Herbal tea (also known as Stone Breaker) as the liquid base of your smoothie to address kidney stones as well. Thanks for the matcha green tea resource, Erin. I like tossing the powder right into my smoothies as well as brewing the tea. Delicious smoothies! I love your ideas! I’m a college student and sometimes I don’t have the time to have a proper meal- so I’m looking for a go-to smoothie with everything (daily amount of fruits, vegetables, juice, protein, energy, vitamins, minerals, etc). Any recipes? Smoothies can be the perfect “fast food” for college students. If only I could go back in time…Anyways, I have a variety of recipes (over 150) to choose from. Browse by category or ingredient and try a couple that sound good. Can I freeze smoothies? I am very busy and if I could store some already made smoothies in the freezer , it would help so much! Sure you can freeze smoothies. Or you can refrigerate them for up to 24 hours. Thanks for the above, is very useful. I’ve just got into smoothies and looking for some help. The base of my current ingredients is juice I buy from the supermarkets. However I was looking at the breakdown and these are very high in sugar, all natural I pressure, but nearly 25% of daily allowance. What else can I use as the bulk ingredient before fruit and seeds are added. That’s the problem with juice – it’s high in sugar, even organic and natural. I recommend using sparingly. Water, tea, and milk are great alternatives. I have a relative who just had open heart surgery and I would like to send a care package for a couple of smoothies that would help boost the healing process and also help to boost the immune system. Any suggestions? I already purchased the following ingredients, but I am not sure about measurements per item…. and if I am forgetting something major. I’ve noticed that vanilla flavor, whether in a Green’s or protein powder seems to be a dominant flavor and is quite a good flavor. Are there any suggestions where to use the vanilla extract or not to use it. Seems about 1/2 or 1 teaspoon is about right. I came across an unsweetened coconut milk with only 45 calories. When using coconut milk can you skip using any other good fat like coconut oil and avocado? If that coconut milk only has 45 calories it must not contain much fat. I would still add other good fats. Thanks for the information! Is there a limit to how many different powders we should be adding to our smoothies? I currently use chia seeds, flaxseeds and coconut oil but would definitely like to try some new ones! Is it okay to add them or should I stick to a few? Thanks! There’s really no limit to the number of powders (or ingredients) you add to your smoothies, Britt. Typically, the more the merrier. However, most people find a sweet spot and it can get expensive if you’re adding a plethora. Experiment and find what works best for you. Happy blending! I advise against keeping tea for more than a half-day. For smoothies though, you can probably accept the lose of quality. In any case, don’t keep it for more than a week — it will go bad! It probably depends on the type of tea. Fresh is almost always best. However, I find refrigerating tea for up to week for smoothies is worth the hopefully minute loss of nutrients compared to the time I save. Hi Ryan. Your site is great! I’ve been using whole flax seeds in smoothies. Someone said I’m wasting them if I don’t grind them first. Is that necessary? I like the little chewiness in the smoothie. Grinding is not necessary, Amy. Chewing is a good thing as it improves digestion. I often advocate chewing your smoothies for this reason. I would pick and choose from the op’s suggestions. Try them all in one pot by all means but it may be a bit funky with ginseng, mushroom powder and other poignant flavours. Yes, no need to include everything in one smoothie. Would likely taste pretty funky. This is only my 1st week trying out random stuff and than I found your page great tips. Thanks for the kind words about my site, Tiffany. Good luck with your smoothies and let me know if you have any specific questions. I’m wondering whether I can take all my encapsulated supplements and dump them into my smoothie? I realized that all those capsules may not be so great for my body/digestion. Is there any harm in doing that? Also, I use hemp powder from Bob’s Redmill and also sometimes good quality organic tahini as the main protein source in my smoothies. Without knowing exactly which supplements you’re considering dumping into your smoothie I can’t say either way. That said, most powdered supplements are fine in smoothies. Hemp powder and tahini are good sources of protein. I actually find non liquid fats blender better than liquid, which tend to clump to frozen ingredients. Coconut oil, ghee, and avocado, my 3 favorite fats all blend well when solid. Flax seeds can be used whole or the oil added. The nutrition you get will vary and I would rotate between seeds and oil if you use regularly. Hi Ryan I’m 48 and just started vegan diet, is there any limit to seeds, spices, veggies and fruit I should restrict to particular smoothies as I find it much easier to just bomb the lot in the blender one go regardless of taste, I only use coconut milk and green tea to thin it down. My top caution is too much sweet fruit. If you over do that you’ll create what I call a “sugar bomb”. Otherwise, use as much of the other ingredients as you’d like, but pay attention to how you feel afterwards. Your body will tell you if you’re consuming too much of something. I just discovered your website and all of the wonderful information you provide. I don’t know if you saw this new product in the grocery store called fruit and veggie blenders. I believe Walmart handles them. I get mine from Festival Foods. It’s a large bag containing around 8-10 smaller bags of premixed fruit and veggies in the proper proportion to make smoothies. There are a number of different combinations you can get. I switch between these and making my own combinations where I include super foods. I wasn’t familiar with “fruit and veggie blenders” until just now, Dennis. Great idea! I’ve seen similar products.